Gardner staffers said building management told them on Thursday that the other tenants had begun to complain and that the protesters no longer could remain there. Needless to say, that’s not real good. About a dozen protesters — many with disabilities — were arrested in U.S. Sen. Cory Gardner’s Denver office on Thursday, two days after they began a sit-in to demand that the Republican senator pledge to oppose the GOP’s plan to repeal and replace Obamacare. 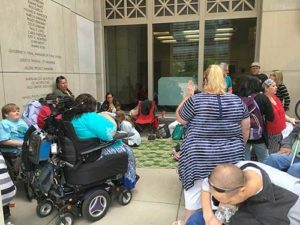 “Rather go to jail than to die without Medicaid!” protesters, some in wheelchairs or lying on the floor, chanted while Denver police stood in the doorway of Gardner’s office and ordered them to leave. The demonstrators then live-streamed their own arrests on Facebook while the chanting continued. Police also used video cameras to record the arrests. “Stop fighting!” a police officer told one of the demonstrators as officers moved in. “We’re not fighting,” one of the demonstrators responded as an officer cuffed a fellow demonstrator and began carrying him away. Police picked up some protesters, cuffed them and forced them into their wheelchairs and then wheeled them out of Gardner’s office. “You’re under arrest,” an officer said. UPDATE: As of 7:30PM, Denver Police have arrested most of the protesters in Gardner’s office. 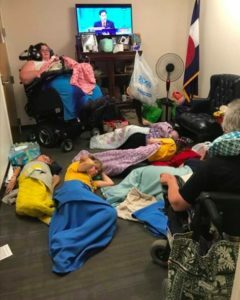 “It’s been really hot and cramped in here, but we’re not leaving until we get a commitment that Sen. Gardner will vote ‘no,’” said Carrie Ann Lucas, 44, an attorney with the state of Colorado. Gardner’s aides have not asked the protesters to leave, and one of the aides stayed with the group for much of last night, according to the Denver Post. However, Lucas said they’d repeatedly asked for — and been denied — an opportunity to meet with Gardner in exchange for ending the protest. The occupation by ADAPT Denver of Sen. Gardner’s Denver office isn’t the only such action taking place right now, but it’s been one of the most successful in terms of gaining media coverage–as well as successfully occupying their objective for going on three days now without being arrested. That appears to be the result of Gardner making the deliberate choice to not have them arrested, clearly hoping to wait out the protesters rather than guarantee himself the bad press of police dragging protesters with disabilities out of his office. Everything we know about these particular activists suggests that Gardner doesn’t know who he’s dealing with. ADAPT is a fixture in local grassroots activism, very knowledgeable of their rights and responsibilities as civilly disobedient protesters, and are fully prepared to camp out in Gardner’s office for as long as it takes. There is a group of supporters holding vigil outside on a continuous basis, running supplies and other assistance upstairs as needed. So whatever Gardner does to resolve this, he shouldn’t hold his breath. "They are losers, so they should lose." Oh, and don't any of you Dimmicrats try to pick "winners and losers" because that's not the American Way. Gardner is going to have to move his offices. Is it just the Denver office? It should be done at each of his field offices. OFA organized a "Walk-in" a week or so ago. I participated at my local Gardner office – went in, had my 10 minutes of talk with the very professional and civil staff person, and walked out. Occupying, though…takes a level of commitment, putting one's life on hold – these activists in Gardner's office all work, and many have kids and families. It may come to a general strike situation, where everyone protests, and business of the day just stops, if the GOP keeps grinding ahead with all these untenable laws, but we're not there yet. To see who these activists are, and what brought them to this action, see Wayfaring Stranger's photo album with short bios of the occupiers. I tried to post it this morning, on the other thread, but the post is still moderated. They are all working people – A musician / rapper, counselor,, lawyer, health aides, pre-med student, former firefighter, and at least one Denver Senate candidate in the mix ( Zach Neumann, for SD32 in SW Denver) are in the mix. Far from being "dupes" or "exploited" by leftists, these are articulate, passionate, committed heroes are leading the charge for all the voiceless folks who use and need Medicaid, and who will be kicked to the curb by the BCRA Wealthcare bill. Kids in my school will have special education services cut, including vision and hearing screenings. Nursing homes in my community might have to close if 60% of their residents can no longer afford to live there. And where will those residents go? Are you going to take them in, Moderatus? AC? Bueller? Anyone? The live video feed comes off and on, but is generally accessible at the Facebook feed of Carrie Ann Lucas, a Colorado attorney and an occupier. I think that the activist's use of social media and the continuous live streaming is helping the cause, too – if Gardner panics and the police start dragging them out of there, it will be seen and heard around the world. Urging Cory to be reasonable, look at facts, meet with his constituents, bust the party line? You guys aren't that daft, are you? Not that daft, Zap. Although I expect the cumulative effect of hundreds of constituents meeting and discussing the same things with his staff (don't cut medicaid, don't vote for BCRA, keep Dodd-Frank in place, etc) must wear his Teflon hide down a bit. There are a few organizations working to keep the pressure on: OFA , Indivisible chapters in various cities, Bernites, Dems, Ultraviolet…apparently, we're better at coalition politics than we used to be. That is one Trump effect. The occupying of Cory's Denver offices, though, by people he can't dismiss and who have great public sympathy and credibility….there's no "business as usual" there. That's why this occupation is so much more effective than any action the "resistance" has done so far. Gardner's staff seldom answers the phone or talks with real constituents, anyway, so occupying the offices won't interfere with that. Certainly, Gardner doesn't do those things.But he’s got to hate the press, the social media, the constant attention. So yes, it's worth doing, even if cynics like you say it is all in vain. didn't say it's all in vain. The police are arresting the Gardner protesters NOW. The live feed is carrying it still. I'm surprised Moldy isn't in here doing a victory lap for the forces of law and order taking these Commie Pinko hippies and putting them in their places. Really hard to watch. Cory Gardner would rather have them hauled out like animals than talk with them about health care. Dawn Russell was chanting all the while she was being loaded into the van: Shame on you Cory Gardner!…. If you want to help at this point, donate to their legal fees and bond c/o National Adapt. If you want to know their names and stories, see this photo album. Aides to Gardner said he has kept at least one staff member in the office at all times — including overnight on Tuesday and Wednesday — to ensure the demonstrators weren’t removed by security. But they said building management told them on Thursday that the other tenants had begun to complain and that the protesters no longer could remain there. He must have a pretty good lobbying job lined up somewhere, because he sure doesn’t seem to care about getting re-elected. Police were just doing their job in getting them out of the office but DA should drop charges immediately. Appearing before a small group of donors and activists recently, NRSC Chairman Cory Gardner (R-Colo.) expressed concern about how the political environment is making it harder to get candidates into races and said the wooing of potential Senate candidates was going slower than expected, said one person who was present for the private gathering. Potential contenders, he said, were deeply uncertain about whether to enter races given the challenging political conditions and worried that things could get worse. An NRSC spokeswoman said "our recruitment efforts are going as planned" and disputed the notion that Gardner had concerns about Trump or the political environment. "Chairman Gardner, who didn’t get into his Senate race until March of 2014, knows firsthand that candidates do not need to announce early in a cycle to win," said Katie Martin, the spokeswoman. Yeah, Gardner, if you want to know why the political environment is concerning for Republican candidates, you might want to look in the mirror. You're not helping. As far as anyone knows, you're a hardnosed bully who gaveled down any Democrats that wanted to speak on health care, traveled to the Philippines on a mysterious errand to gaze adoringly at a brutal dictator, and now you're the guy who ordered nine protesters, most of whom were disabled , to be dragged out of your office and arrested. And then you freaking lied about who ordered it done. You are toast in 2020. Hard to say what will happen three years from now but he is certainly doing his best to create a fanatical opposition that will not rest until the votes are counted. And who is going to rush to support him? The wealthy patrons that everyone else hates because they can buy politicians. Very few upsides for Cory to act like President Snow in Hunger Games. What'll happen in three years? I don't know everything that's liable to happen, but I'll bet cash money these recordings will resurface in at least one Dem's campaign commercials against the Conman. Man. I think it's gonna get even more brutal on Gardner's facebook page. I saw him in a news clip today standing cheek to jowl in a photo op with McConnell grinning at the camera and sending the unmistakable vibe that he along with the rest of the dirty dozen are going to bring down healthcare in America come hell or high water. To then turn around and unleash the security apparatus on the disabled, isn't going to earn him points as a good old boy moderate who is looking out for everyone's welfare. Of course his staff will never give up the real story but if he ordered them to have the protesters removed before he comes back to Colorado then he deserves every ridicule and derision that folks can apply. Best case he looks like a creepy jerk to let the building supervisor take the fall. Nothing says 'weasel' to the American people like not owning up to your decisions. There are several police brutality cases where you'll find that this was a pre-emptive tactic used by the arresting officers to reduce fault if something bad happens, like someone dies while being arrested. Saying "stop fighting" or "stop resisting" whether or not the person is fighting or resisting visibly or not, and whether or not there are 4 or 5 officers on someone's back, will conveniently be used in their defense. Act now to save Medicaid. There is a rally to save Medicaid and support these protesters, tomorrow at 3 pm in Fort Collins outside Cory Gardner's office on Shield st by Roland Moore park. The photo on the front page of the Denver Post today really captures the inhumanity of what Gardner and the Dirty Dozen are doing. The most vulnerable in our society being treated as criminals. It doesn't matter what kind of denial Gardner gives in the text of the article. That photo is a brutal reminder of what's at stake and how heartless Republicans are to destroy lives so that those with the most can get even more. But, GG, those are not important lives…they can't make 5 figure donations to his campaign. Cory doesn't need those people. How can you expect him to care about them? I mean, really. That answered my question, G.G. I've been clearing out e-mail and haven't opened the paper yet, but I wondered if this made the front page. As I said last night. you can bet that paper and the video from last night will be featured in someone's campaign commercial against Conman Cory. I'm kind of surprised that our local high priest of the Prosperity Gospel Pear hasn't weighed in on how if these people just worked harder than they could afford nice things like essential health care. He usually never misses a chance to remind people that it is up to them to work harder to get off the government gravy train. Andrew also seems to be missing on this thread. I guess he couldn't figure out how to insert Democrats and assassination into a discussion about arresting disabled people. Sometimes when you are a one trick pony the circus passes you by. Haven't seen much of him or Moldy lately. The Crazy Joe, Low IQ Mika and the Donald imbroglio maybe have driven those two away. PP has taken up the cause in their absence. The last of the "Camp Gardner" detainees was released from jail at 2 am this morning. More than 36 hours on a simple misdemeanor trespassing charge. Supporters at the jail included Rep. Joe Salazar, who live-streamed the vigil at the jail, Senator Aguilar, Majority Leader Duran, and Rep. Herrod. If Cory Gardner had wanted to show some remorse for having these protesters dragged out of his office, a great way would have been for him to contact the sheriff and ask for the trespassing charges to be dropped. He didn't do that. Instead, the Denver Jail kept these people for 36 hours and let the out at 2 am in the morning, which would have been very dangerous for anyone, let alone a disabled person, if not for the supporters who had waited for them. Gardner camp detainees celebrate finally being released after 36 hours on a simple trespassing charge when Cory Gardner had them forcibly dragged out and arrested. Two sisters, Dawn and Hope Russell, and Carrie Ann Lucas, had already gone home to a well-deserved rest. My hat is off to this intrepid band of troublemakers…Right on, people!